EW DELHI: There is no escaping the fact that gaming industry in India is still very niche and companies need to build more avenues to tap on a market that has a massive potential. While there are several brands offering gaming PCs and notebooks with beastly specs at equally eye-watering prices, a firm that makes you sit up and take notice is HP. HP, in a very short span of time, claims to have made several strides in the gaming industry, matching themselves among its top competitors in the country if not above them. Marching forward it recently launched a compact desktop with a mixed reality headset, claiming to make ‘gaming with freedom’ a thing. We got our hands on these two gaming products few days back and it has hit our productivity levels to a new low. So does the powerful OMEN X compact desktop with VR backpack along with the HP Windows Mixed Reality headset prove to be a gamer’s ultimate delight? Let’s find out. 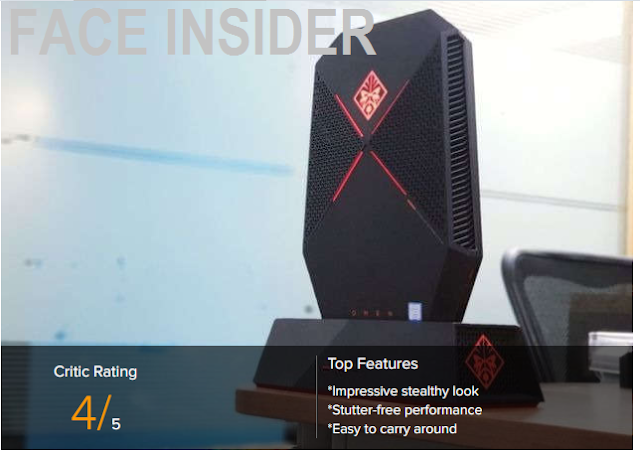 HP Omen X Compact Desktop is the most visually appealing compact desktops we have seen lately. It carries a stealthy black coloured look with red accents, something that falls in line with the rest of the HP Omen line-up. It looks stylish sitting at the desk (via a dock station) but at the same time takes a good amount of time to set up. However, once set up it certainly becomes the cynosure of all eyes. Curious and inquisitive colleagues often popped in to check the machine out. Although it is more than just a looker as it caters to those who are enamoured by VR -- those who love to play VR games or view VR content while on the move. The compact desktop comes with a VR backpack. You can install the compact desktop on it and connect it with the VR headset to play without any limitations or wires distracting you in any way. The compact desktop is made out of plastic in a design that mixes both plain and designer look, which also acts as a vent. Adding to the look are four LED lights and the glowing HP emblem. It’s dock station has a large Eject button on the side and a bunch of ports at the back and front. The compact desktop too has ports on top. Together, they are close to 4 kg. On the desktop, you get two USB 3.0 ports, a Type-C port, HDMI 2.0, Mini DisplayPort, headset jack and a power output for VR devices. On the bottom right side there is two more USB 3.0 ports. On the dock station, there are a couple of USB 3.0 ports and a Type-C port at the front and three USB 3.0 ports, DisplayPort, HDMI, Ethernet and a power slot at the back. Given the power HP Omen X Compact Desktop boasts of, one can hardly complain about any kind of stuttering or lags. For the record, the computing machine runs on 7th generation Intel Core i7 processor (7820HK) alongside 16GB DDR4 RAM and a Nvidia GeForce GTX 1080 GPU to power heavy VR-based titles. Running Windows 10, it also comes with McAfee LiveSafe and Microsoft Office 365 software. If you already own a HP Omen device, then HP Command Centre won’t be something new for you. The software lets you customise the zones with up to 16 colours. Mounting the compact desktop on the VR backpack and playing games is fairly easy though. Although it looks bulky, to our surprise much of it wasn’t felt when we actually wore it and started playing. We used HP’s Windows Mixed Reality headset, which costs Rs 51,187. It has twin 1440x1440 pixels displays, double padded headset and easy adjustment knob. It is easy to tighten or loosen up the headset’s band as well. When starting with the setup, it would ask you to configure the sensors of the headset and adjust it based on your position (standing or sitting). Although the experience of playing titles on a VR headset is a different one in itself, the very idea of giving gamers the freedom to move around freely without any limitations does prove to be a catalyst in making certain decisions. Streaming titles at decent frame rates (above 70fps) was a delight and without any kind of issues cropping up. On PC Mark 8, the device did score well above 3500 mark but still is not the best right now. We did try titles like Rick & Morty: Virtual Rick-ality and LEGO Batman Batmersive VR Experience. As for the ‘VR Backpack’, it is more of a harness without any pockets that is only made to attach the compact desktop. It is fairly easy to set the desktop on it and play for a few hours. It has a padded belt and shoulder straps, which makes it feel comfortable. HP is bundling it with the desktop unlike in regions outside India. In terms of battery, you may think the HP compact desktop may not be impressive because of its beastly specs and power-hogging innards. But it is not as bad as it seems. HP gives you two external batteries to try out and they hardly went on for just over an hour. The company claims a battery can run for an hour each, which of course is in ideal/controlled environments. The VR backpack also has slots where you can fix the batteries to play VR games while on the move. These rechargeable batteries also support fast charging, leaving very less for us to complain. An aspect that we often complain about in most gaming devices. HP has gained some strides with the Omen X Compact Desktop gaming device. It has also made a big splash in the virtual reality market with the MR headset. Although the idea has no flaws, the question here arises is that how much time till it stays in the ‘niche’ segment. You already have the content coming from Steam and other platforms but the adoption is something that may take nothing but a few more years. Add to it the fact is that it is an expensive rig -- more expensive than your regular gaming desktops and laptops. But if you have that much money to shell out, based on looks, the idea of VR with freedom, and how the desktop performs along with the VR headset, it is one of the best offerings by HP in the world of gaming. पश्चिमी चम्पारण सेमरा मदरसा पे एक ख़ास नज़र? Is Bitcoin Mining Still Profitable?